contact me to book a show! This is a private concert for students at Scrollworks. I’ll be performing my radicans project. Bring your instrument, or just come to listen. No previous experience is necessary. The workshop is free and open to the public, with a $1-$10 suggested donation. Two world premiere performances featuring a first-time meeting of Braxton with Alabama legends LaDonna Smith (viola) and Davey Williams (guitar). Braxton will also reunite with 79-year-old master drummer Alvin Fielder for the first time since 1970. I’ll be performing live electronics as part of the Falling River Music Septet. A live performance of some of Braxton’s scores featuring University of Alabama faculty members Andrew Raffo Dewar (soprano saxophone), Tim Feeney (percussion), Holland Hopson (electronics). Craig Hultgren will perform my piece Nine Islands, Nine Dialects for cello and speaking cellist. 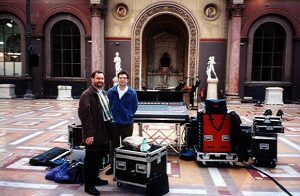 Tim Feeney and Wendy Richman will premiere my piece Glacial Erratics for two sustaining instruments and electronics. I’ll be performing John Cage’s Variations III with Tim and friends. This is a tribute concert for Lou Cohen. with Tim, Andrew Dewar and Jubal Fulks. 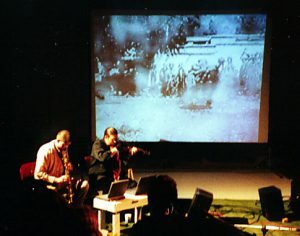 Three ensembles (Stanford, CA; Troy, NY; Belfast, Northern Ireland) perform an improvisation directed by Pauline Oliveros. The co-op will premiere my vocal quartet, Nine Tas. Download the score. I’ll be sharing the bill with Taylor Kuffner and Ben Neill. Percussionist Max Lord will perform on the Marimba Lumina with choreographer Ellen Godena in a work for robot percussion and spontaneous robot-inspired movement. See a video from this performance. See photos from this performance. CD release party for Bee vs. Moth‘s Soundhorn featuring an extended line-up with bari sax, soprano sax, and trumpet. New music for instruments and electronic sound with special guest Ivo Bol from the Netherlands. This event is part of the Society for Electro-acoustic music in the United States (SEAMUS) annual electro-acoustic music month. Interactive electronic music celebrating the 15th anniversary of the MFA in Electronic Arts. Michelle Schumann and Austin New Music Co-op present Happy Birthday Mr. Cage! the 6th Annual John Cage Birthday Celebration. Read the Statesman Blog review by Jody. XL recommends this show. Read about it here. I’ll be playing soprano sax as part of the 11-piece ensemble. This is the world premiere of compositions by Travis Weller and Brent Fariss. XL recommended this show. Read about it here. Austin Cobra Players present John Zorn’s Cobra and other game pieces. CD Release Party for my latest release, the all-electronic With Hidden Noises. 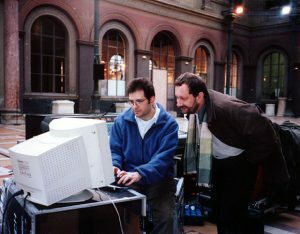 The Party will feature the four-channel sound installation by the same name which generated all the sounds for the CD. End of an Ear posted photos from this show. Check them out here. Mr. Shipp will be playing in Austin promoting One, his new solo album for Thirsty Ear‘s Blue Series. XL chose this show as a recommended gig. Read about it here. See photos from this show here and here. Austin New Music Co-op presents Manlove-mania! A going-away party for Keith Manlove. The Center for Art Rock Policy (CARP) summer concert series moves to San Marcos. I’ll be sitting in with Bee vs Moth. Also on the bill are The Invincible Czars, Opposite Day, and Muppletone. 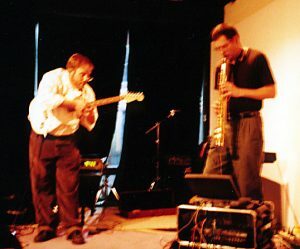 Austin Cobra Players present John Zorn’s Cobra as part of the Center for Art Rock Policy (CARP) summer concert series with The Invincible Czars, Opposite Day, and Muppletone. I’ll be sitting in with Bee vs Moth for part of the Center for Art Rock Policy (CARP) summer concert series with The Invincible Czars, Opposite Day, and Muppletone. See photos from this show here. I’ll be sitting in with Bee vs Moth for the kickoff of the Center for Art Rock Policy (CARP) summer concert series with The Invincible Czars, Opposite Day, and Muppletone. a 12-minute short with an original score written and performed by Holland Hopson. “The Case of Clyde Baxter” took home 1 of 2 “Best in Festival” awards! This concert is an Austin-American Statesman Music Pick of the week! Read the recommendation online here. Listen to recordings from this show. Pierre Joris and Nicole Peyrafitte present SUMERICABACHBONEs, an audiovisual performance with music by Holland Hopson. I’ll be sitting in with ECFA. 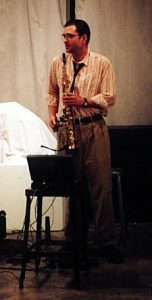 I’ll be playing with Alex Coke and members of ECFA, and will premiere a new saxophone duet in honor of Steve Lacy. I’ll be sitting in for James Alexander with ECFA. No Idea Festival: small and large ensembles including Charalambides, Maria Chavez, Chris Cogburn, Alex Coke, Dave Dove, Thomas Helton, Holland Hopson, Kurt Newman, Carl Smith, and others. 22nd St. & 11th Ave.
Chris Mann performs his “Plato Songs” as part of a program presented by the Electronic Music Foundation including music by Joel Chadabe and Joan LaBarbara. Software solutions for “Plato Songs” by Holland Hopson and R. Luke DuBois. Holland Hopson will demonstrate and speak about his 4 channel audio installation With Hidden Noises using Marcel Duchamp’s “With Hidden Noise” sculpture as a controller. The replica of the sculpture will control the sounds of machines (coffee grinders, railroads, pulleys, spinning disks, etc) intended to conjure aural images relating to Duchamp’s work. Produced & Conceived by Maria Pessino. Directed by Marisele LaGrave. 66th St. and 5th Ave. N.